Home / What are Fractals? 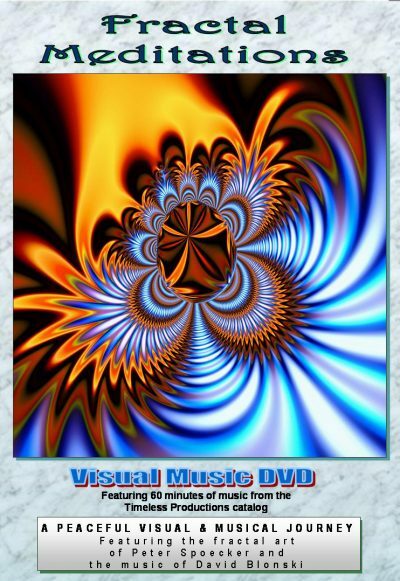 David’s Fractal Art was initially used as multi-media content for his live concert performances and then later went into video productions and printed media. David creates his imagery on a computer using mathematical formulas capable of creating an infinite number of points in space that are arranged in unusual organic patterns. By using different formulas, color palettes and filters, David searches for new and unexplored “fractal realms” to create vibrant original images while dancing upon the edge of chaos. David’s first exploration with fractal geometry was a colaboration with fellow artist Peter Spoecker and their work made its way into David’s first visual music release of “Fractal Meditations”. The images you find in our fractal art gallery are, in the simplest terms, artistic and graphic representations of mathematical formulas. The mathematics used to create fractals has been called the “Geometry of Nature”. It is a newly discovered form of math that is used to describe in mathematical terms the shapes & patterns that we see in the natural world. Traditional Euclidian Geometry could define the shape of a square, rectangle, triangle and even a circle but it was impossible to mathematically describe the shape of a tree, a river delta, a cloud, or a gaseous nebula until the discovery of fractal geometry. Before the discovery of fractal geometry these shapes and systems were considered too chaotic to be studied mathematically. While the roots of fractal geometry go back to the 17th Century, it was Benuit Mandelbrot who first coined the term “fractal” in 1975 and developed the Mandelbrot equation that created a break through in describing mathematically what we see in the natural world. Whether we are looking at an ocean coastline, a tree, the veins and capillaries of our bodies, the spiral shapes of a nautilus shell , a hurricane or a spiraling galaxy, their pattern and shape can all be plotted and explained through fractal geometry. Today Fractals are used in the computer modeling of irregular patterns and structures found in nature and it is what makes the high level of today’s computer animation possible. All movies using computer graphics (CGI) make use of fractal algorithms used in rendering life-like imagery. But that is not all, fractal mathematics are also being used in analyzing population statistics and in storm prediction, soil mechanics analysis and seismology, medical studies, antenna design, signal & image compression schemes and their use can benefit nearly any field of science and technology that requires complex system analysis. Fractals, as an art form, began with the discovery of the Mandelbrot equation that when plotted graphically yielded the image seen to the right. The most interesting thing about this image is that as you zoom into the edge of the image you see a repeating pattern that is infinitely complex that yields repeating but subtly different images. Because fractal formulas are self-repeating, there is no end to the pattern as you zoom into the image. They are infinite in their nature but because the math gets more and more complicated as you go deeper into the fractal it gets very time consuming to plot and render images the deeper you go. Some of the images I have created have taken more than 14 hours to render once all the parameter of the equation and color pallet are entered. By applying different color pallets and altering the formula you get different results and patterns with infinite possibilities. When you view fractals you will see patterns that are both familiar and alien to our experience of the natural world because it allows us to peak into alternate universes of infinite variation. Most of the images that I have created in the video and on my gallery site have been created using formulas that have been developed by fractal mathematicians or fractal explorer’s like myself. By using different formulas, color pallets and filters, fractal artists can find new and unexplored “fractal realms” that have never been seen before. It is my goal to find such unexplored territory to create unique imagery found no where else and I am just beginning to start developing my own original formulas. I am not a mathematician and I am just in the early stages of exploration and study so I hope that this explanation of fractals will grow and develop with time and I hope to share what I discover here on these pages. The images that you will find on our Fractal Gallery site represent the work I have done over the last 7 to 8 years years and literally thousands of hours of exploration. For every image you see on this site there are at least 10 others that will only be used in my videos and won’t make it to print. For every image I create and keep for use there are hundreds if not thousands that couldn’t be used because we are working at the edge of chaos and its not easy to find new and pleasing compositions. As when exploring the universe, there is a lot of empty space and nothingness and this is true of the fractal realm as well and it takes time to find a rabbit hole worth exploring.